Sensei Michael A. Stabile, Yon-Dan Sensei Michael A. Stabile is the Head Instructor at the Aikido School of Self Defense in Conyers, Covington, Georgia area and is ranked a Yon-Dan (Fourth Degree Black Belt) in Nihon Goshin Aikido. He opened the Dojo in December of 1997. His goal is to spread the teaching of Nihon Goshin Aikido under the direct supervision of Sensei Robert B. MacEwen, Jr. and Shihan Richard A. Bowe. Sensei Stabile grew up in The Bronx, New York where he had more then his share of fights. He lived there for over thirty years. It is this time in The Bronx that has taught him what works and does not work in the street. When Sensei Stabile moved to upstate New York for a job, he met Sensei Robert B. MacEwen Jr. and started on the path of Nihon Goshin Aikido. Ever since the first day Sensei Stabile stepped on the mat at the Middletown Dojo his loyalty has been to first his Sensei and second to the art. Sensei Stabile has written a book called “Escape With Your Life”. He has been on many television networks both local and around the world such as CNN, CBS and the list goes on. Sensei Stabile has trained National, State and Local Law Enforcement and Security Personnel all over the east coast. 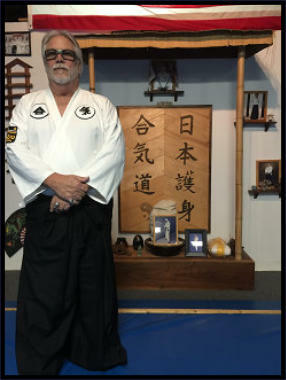 Sensei Stabile opened the Conyers, Georgia Dojo with three main rules that he lives by Honor, Loyalty and Respect. Without these three things there can be no true Martial Art. After 20 years of running the Dojo I look back at all the people whose lives we have changed for the better makes everything worth all the work and time. I am happy for the lives we have changed for the better. My trip on the path of Aikido has been a joy. I look forward to the next 20 years and all the new friends I shall meet. The Dojo door is always open, come on in and say hello. Sensei Ginger Stabile, Yon-Dan Sensei Ginger Stabile is currently the Assistant Head Instructor at the Aikido School of Self Defense. She is ranked a Yon-Dan (Fourth Degree Black Belt) in the art of Nihon Goshin Aikido. She helped her husband open the Dojo in 1997 after they moved to Georgia from Upstate New York. 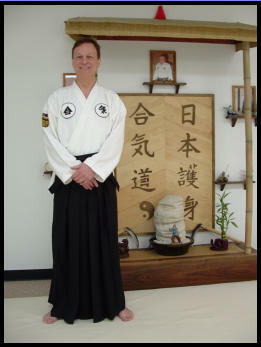 Sensei Ginger also teaches and trains under the direct supervision of Sensei Robert B. MacEwen, Jr. and Shihan Richard A. Bowe. Sensei Ginger enjoys teaching children as well as adults. She also enjoys doing demonstrations, seminars and anything to spread the teaching of Nihon Goshin Aikido. One of the greatest pleasures she gets from aikido is that she gets to do this with her husband, Sensei Michael A. Stabile and her daughter, D. J. Stabile. Sensei Joel Wheelus, San-Dan Sensei Joel Wheelus has been in the martial arts for many years. He has trained in fencing, Kung-Fu, and Tang-su-do. 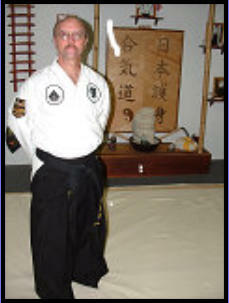 Sensei Wheelus started his Nihon Goshin Aikido training under Sensei Michael Stabile and Sensei Ginger Stabile in 2001 and earned his Sho-Dan (First Degree Black Belt) in September, 2007 at the age of 47, demonstrating that you are never too old to learn Aikido. He is now ranked a San-Dan (Third Degree Black Belt) he received his San- Dan in 2016 Sensei Wheelus looks forward to bringing his knowledge and skill level to all the students of the Aikido School of Self Defense, passing on the art to all that train in the Dojo. Sensei Danielle Stabile (DJ), Ni-Dan Sensei Danielle Stabile started her training in Nihon Goshin Aikido when she was 3 ½ years old in July, 1998 under Sensei Michael A. Stabile and Sensei Ginger Stabile. She has trained 2 to 5 days a week since she started training. 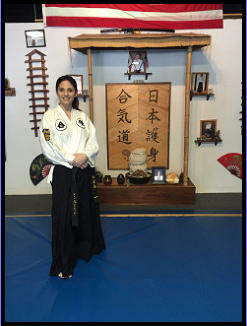 She has over 6 years teaching junior students in the dojo and now is teaching adults and Juniors. She has trained in Sensei Robert B. MacEwen, Jr. Seminars twice a year for 9 years and has participated in numerous demonstrations. Sensei Danielle Stabile’s Black Belt line was done in front of Sensei Robert B. MacEwen, Jr. during the March 2008 Seminar at the age of 13. 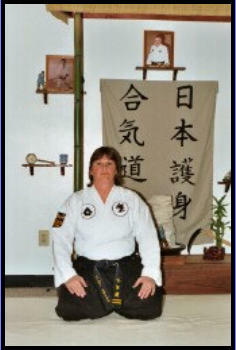 She was the first student to hold the rank of Kohai Sho-Dan in the Conyers Dojo. We look forward to her teaching for many years and one day taking over the day to day running of the Dojo. She brings a very different style of teaching to the Dojo and Nihon Goshin Aikido. It is an honor to have a young spirit teaching and with all her energy, we can only hope that the older students will be able to keep up with her. She is now ranked a Ni-Dan (Second Degree Black Belt) she received her Ni- Dan in 2016 FUTURE INSTRUCTOR Angelina M. Stabile, Junior Yellow Belt Angelina M. Stabile started her training April 5, 2018. 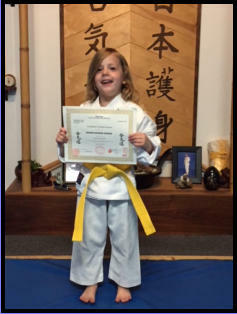 She has earned her Junior Yellow Belt on September 12, 2018. We look forward to the day that she is on the mat helping other students as a Black Belt. which hopefully will be around 2030. Angelina is on the path of Nihon Goshin Aikido, following the path of her Mother, Grandmother and her Grandfather and all the other Black Belts in our Association. RETIRED Sensei Bob Morrison - Sho-Dan Sensei Bob Morrison is a Sho-Dan (First Degree Black Belt) in the Nihon Goshin Aikido Association. He trains directly under Sensei Michael A. Stabile and Sensei Ginger Stabile. Sensei Morrison became a student of Aikido in 1999 after learning of the art and its value as a highly practical form of self defense. He enjoys teaching others and watching their confidence and skill levels grow as they learn to master and art, which conditions both the mind and the body. As an attorney, Sensei Morrison also serves as legal counsel to the dojo. Sensei Jeff Schnier - Sho-Dan Sensei Jeff Schnier started his training in Nihon Goshin aikido in March of 2000 under the direction of Sensei Michael A. Stabile and Sensei Ginger Stabile. 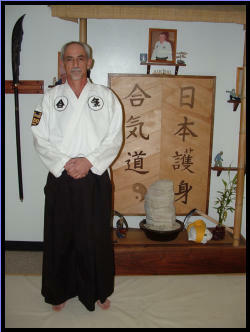 Sensei Schnier has trained in many of Sensei Robert B. MacEwen’s seminars. Sensei Schnier’s loyalty and dedication not only in the dojo, but to the Art go without question. He earned his Sho-Dan (First Degree Black Belt) in August of 2006. He plans to continue his training and teaching so he can help others obtain their goals in Nihon Goshin Aikido. 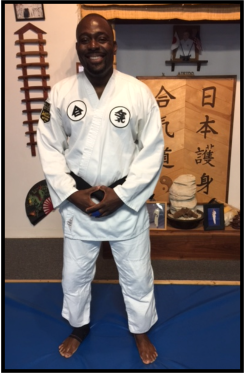 Sensei Thomas ( Kwame) Moore, Sho-Dan Sensei Thomas Moore began his training in Nihon Goshin Aikido under Sensei Michael Stabile in 2012. The fighting style of Nihon Goshin Aikido appealed to him and he also wanted something different and traditional. He dedicates his life to Nihon Goshin Aikido and other martial arts. Sensei Thomas Moore’s athletic ability, dedication, open mindedness and hours of on the mat lead him to achieve a Sho-Dan in 2017. Sensei Moore has his eyes on not only opening a Dojo here in Georgia but is looking across the Ocean at his home land of Ghana to one day have aNihon Goshin Aikido Dojo there. He will continue to learn and grow in the Art of Nihon Goshin Aikido.